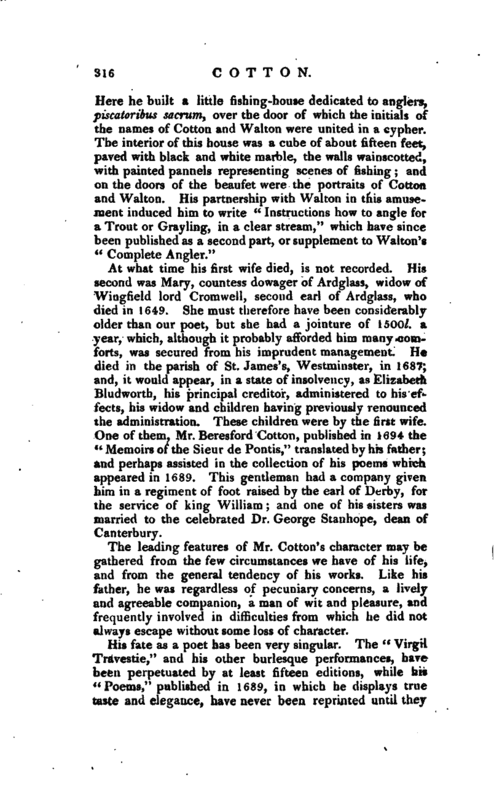 , an English poet, was the son of Charles Cotton, esq. of Beresford in Staffordshire, a man of considerable fortune and high accomplishments. His son, who inherited many of these characteristics, was born on the 28th of April, 1630, and educated at the university of Cambridge, where he had for his tutor Mr. Ralph Rawson, whom he celebrates in the translation of an ode of Joannes Secundus. At the university, he is said to have studied the Greek and Roman classics with distinguished success, and to have become a perfect master of the French and Italian languages. 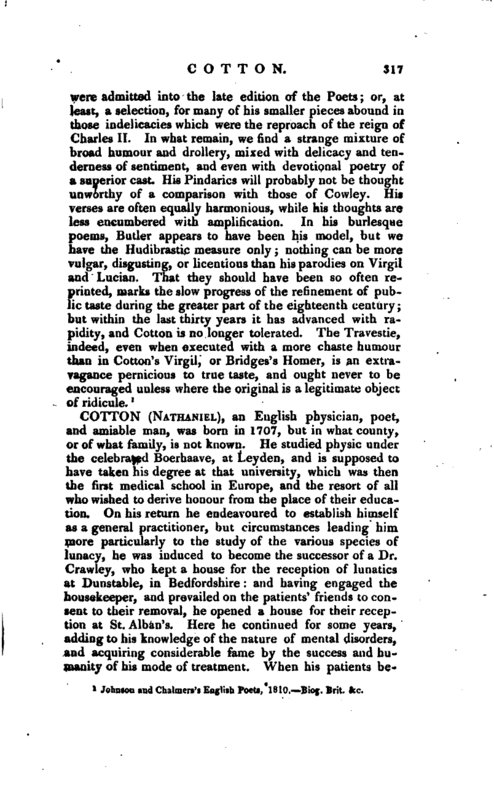 It does not appear, however, that he took any degree, or studied with a view to any learned profession; but after his residence at Cambridge, travelled into France and other parts of the continent. On his return, he resided during the greater part of his life at the family seat at Beresford. In 1656, when he was in his twenty-sixth year, he married Isabella, daughter of sir Thomas Hutchinson, knt. of Owthorp in the county of Nottingham, a distant relation, and took her home to his father’s house, as he had no other establishment. In 1658 he succeeded to the family estate encumbered by some imprudencies of his deceased father, from which it does not appear that he was ever able to relieve it. From this time, almost all we have of his life is comprized in a list of his various publications, which were chiefly translations from the French, or imitations of the writers of that nation. In 1664, he published Mons. de Vaix’s “Moral Philosophy of the Stoics,” in compliance, sir John Hawkins thinks, with the will of his father, who was accustomed to give him themes and authors for the exercise of his judgment and learning. In 1665, he translated the Horace of Corneille for the amusement of his | sister, who, in 1670, consented that it should be printed. In this attempt he suffered little by being preceded by sir William Lower, and followed by Mrs. Catherine Phillips. In 1670 he published a translation of the Life of the duke D’Espernon and about the same time, his affairs being much embarrassed, he obtained a captain’s commission in the army, and went over to Ireland. Some adventures he met with on this occasion gave rise to his first burlesque poem, entitled “A Voyage to Ireland,” in three cantos. Of his more serious progress in the army, or when, or why he left it, we have no account. In 1674, he published the translation of the “Fair One of Tunis,” a French novel; and of the “Commentaries of Blaise de Montluc,” marshal of France; and in 1675, “The Planter’s Manual,” being instructions for cultivating all sorts of fruit-trees. 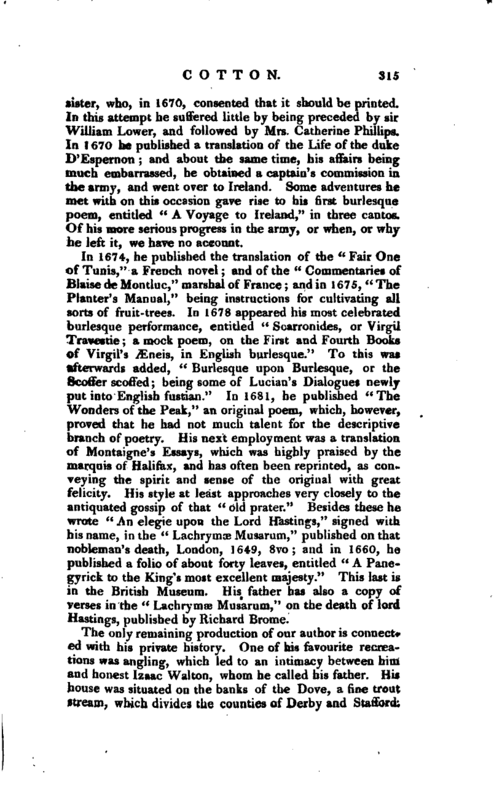 In 1678 appeared his most celebrated burlesque performance, entitled “Scarronides, or Virgil Travestie a mock poem, on the First and Fourth Books of Virgil’s Æneis, in English burlesque.” To this was afterwards added, “Burlesque upon Burlesque, or the Scoffer scoffed; being some of Lucian’s Dialogues newly put into English fustian.” In 1681, he published “The Wonders of the Peak,” an original poem, which, however, proved that he had not much talent for the descriptive branch of poetry. His next employment was a translation of Montaigne’s Essays, which was highly praised by the marquis of Halifax, and has often been reprinted, as conveying the spirit and sense of the original with great felicity. His style at least approaches very closely to the antiquated gossip of that “old prater.” Besides these he wrote “An elegie upon the Lord Hastings,” signed with his name, in the “Lachrymae Musarum,” published on that nobleman’s death, London, 1649, 8vo; and in 1660, he published a folio of about forty leaves, entitled “A Panegyrick to the King’s most excellent majesty. '” This last is in the British Museum. His father has also a copy of verses in the “Lachrymae Musarum,” on the death of lord Hastings, published by Richard Brome. 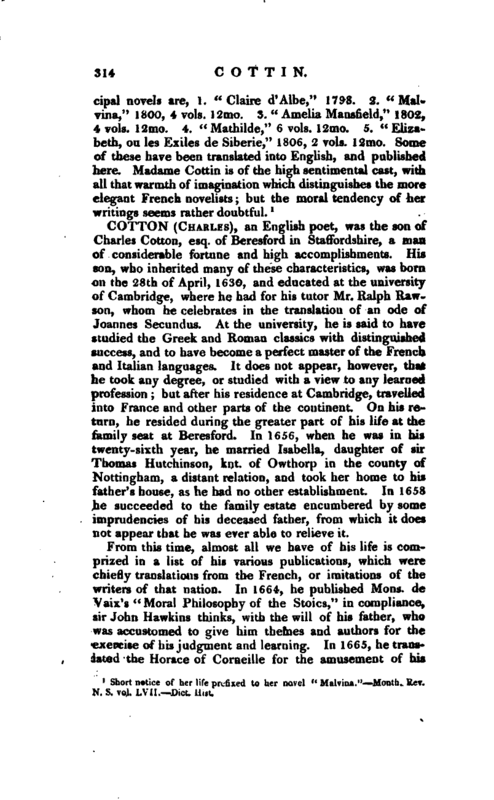 The leading features of Mr. Cotton’s character may be gathered from the few circumstances we have of his life, and from the general tendency of his works. Like his father, he was regardless of pecuniary concerns, a lively and agreeable companion, a man of wit and pleasure, and frequently involved in difficulties from which he did not always escape without some loss of character.